In western Germany, several aspects of religious life have been cited as possible reasons for the steeper declines among Protestants. These include a strong Catholic identity forged from years of existence as a minority religion, and doctrinal differences over salvation that make formal church involvement more necessary for Catholics than for Protestants. 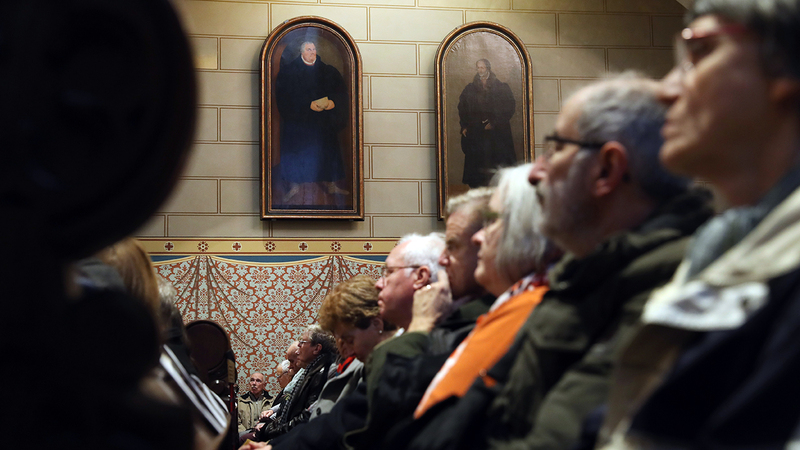 A recent Pew Research Center analysis also shows a drop in the share of Protestants in Germany. 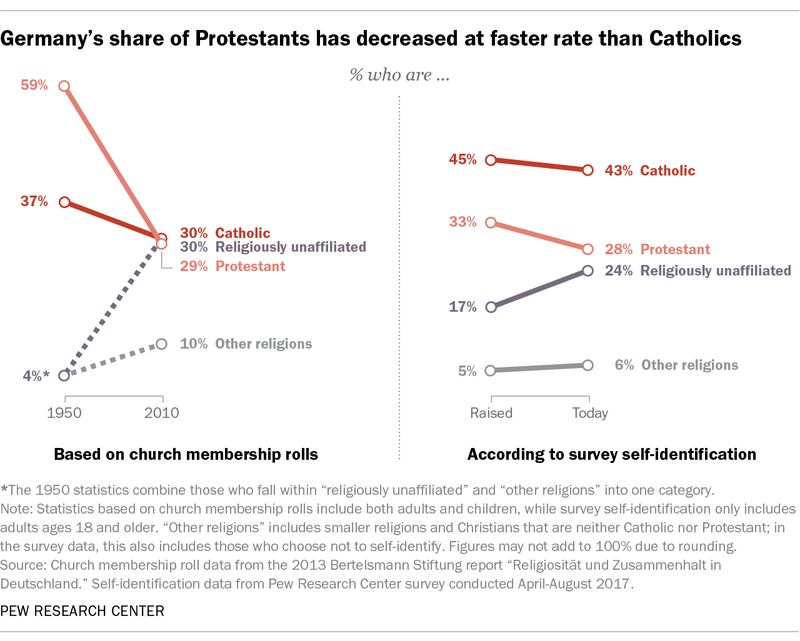 Among adults asked about their current religious denomination (which may be different from what is recorded in church membership rolls) and the denomination in which they were raised, there has been a decline in the share of Protestants (33% raised Protestant to 28% currently Protestant). The share of those who say they are Catholic has largely remained stable: 45% were raised Catholic and 43% currently identify as Catholic. 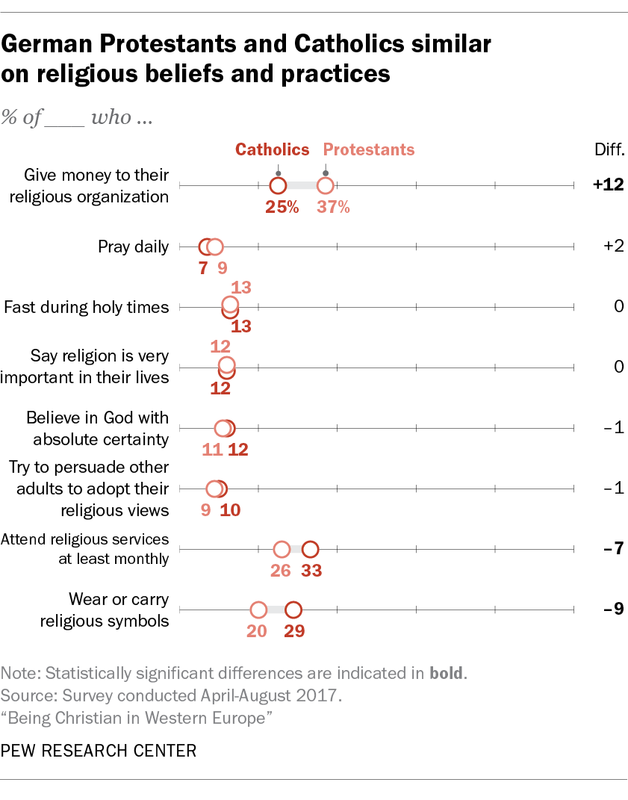 Protestants and Catholics in Germany follow traditional Christian religious beliefs and behaviors at roughly similar rates, according to Pew Research Center data. For example, similar shares in both groups say they pray daily and believe in God with absolute certainty. At the same time, German Protestants are more likely than their Catholic counterparts to follow Eastern or New Age spiritual practices and beliefs. A third of German Protestants, for instance, believe in astrology, while only 23% of Catholics do. 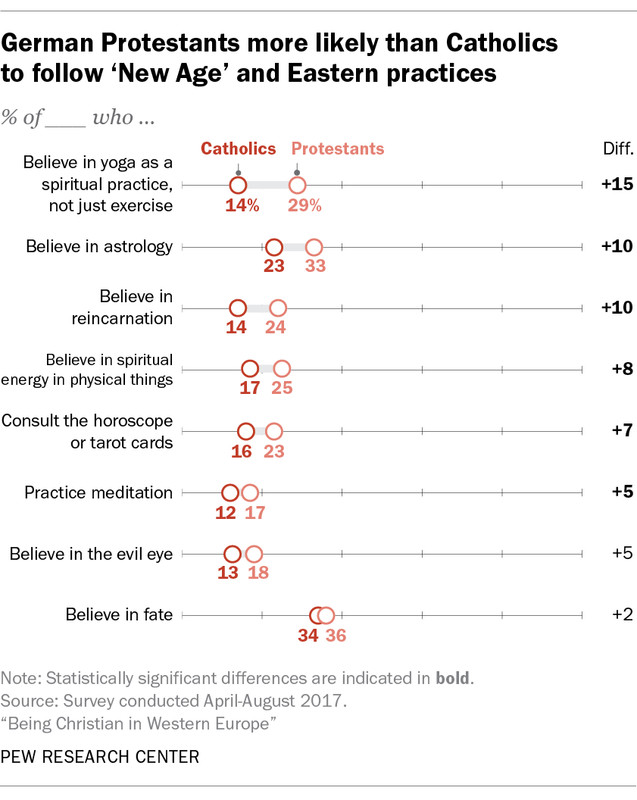 And about one-quarter of Protestants consult the horoscope, tarot cards or fortune tellers (23%), compared with 16% of Catholics. The recent Pew Research Center survey, which was conducted in 15 Western European countries, also examined attitudes on nationalism, immigration and religious minorities through the lens of religious affiliation and commitment. It found that, in general, Christians across Western Europe are more likely than the religiously unaffiliated to score higher on the Center’s 10-point Nationalist, anti-Immigrant and anti-religious Minority (NIM) scale. A higher score indicates higher levels of nationalism and negative sentiments toward immigrants and religious minorities. In Germany, for example, 29% of Christians score in the upper half of the scale, but only 18% of the religiously unaffiliated do. Among German Christians, however, Catholics are more likely than Protestants to profess nationalistic attitudes and to express anti-immigrant and anti-religious minority attitudes. Moreover, Catholics who attend church services at least monthly are much more likely than Catholics who attend less frequently (and Protestants at either level of religious participation) to score in the upper half of the NIM scale. But it should be noted that Catholics and Protestants in Germany are concentrated in different parts of the country, which could also help shape attitudes on these topics.